Rachel Bamberger Chalkowski, affectionately known as Bambi, directs one of the most highly esteemed tzedaka organizations in Israel. Assisted by an international network of volunteers, Matan B’Seter Bambi alleviates the physical and emotional strain of Israeli families who are undergoing medical and social crises. Over 400 families receive monthly stipends, with an additional 600 families receiving help before the holidays, and many emergency cases as well. Bambi’s annual budget is over one million dollars and 97% of every dollar goes directly to those in need. This money helps pay for the most basic of human needs- food, rent, utilities, and medical help- when conventional channels have been exhausted. Moreover, Bambi provides her aid with sensitivity and dignity. Please consider a generous gift. In return, you will receive the grateful blessings of all those whom you have helped. On Purim there is a special mitzvah to give Matanos L’Evyonim (monetary gifts to the poor). Bambi has a special Purim fundraising drive to help about 50 Israeli families in need who live outside of Jerusalem– in Beit Shemesh, Beitar, Modiin Illit, and Haifa. Funds for this special drive are raised by the sale of unique Purim cards. These cards are a great way to show your appreciation to those closest to you. At the same time, you will be performing the mitzvah of Matanos L’evyonim by supporting families in need. Click here to view and purchase this year’s Purim Cards. Matan B’seter Bambi distributes regular monthly stipends to 400 Israeli families who are undergoing a medical or social crisis. Amounts distributed to each family range from $500 to $1,000. Each family’s case is carefully reviewed before assistance is offered, and families are monitored for changing circumstances. Assistance is given to cover the basic necessities of life, such as food, rent, utilities, and medical care not normally covered by Kupat Cholim (Israel’s national insurance). Holidays, which should be a time of happiness, are often a source of financial stress and despair for people in need. Due to the special demands of Yom Tov, about 1,000 families receive between $100 – $500, each according to it’s need. In total, Bambi distributes about $500,000 for Pesach and Succos. This is in addition to Bambi’s regular monthly distributions. There is a special Emergency Fund for people in dire need of money for rent or utilities, essential appliances such as refrigerators and washing machines, eyeglasses for children, hearing aids, medication or other medical expenses not paid for by Kupat Cholim. Often, Bambi does not have adequate funds to meet all these emergency needs. Donations of new or gently used children’s clothing enable hundreds of poor people to warm the hearts and bodies of their infants and children. Clothes are distributed to the poorest communities in Jerusalem and its surrounding areas. Montreal, Denver, and many New York area communities are an integral part of this special project. Several gemachs (free loan organizations) operate in cooperation with Matan B’Seter Bambi but have separate bank accounts. These gemachs make interest-free loans to families in need. One of these gemachs is dedicated to education and job training. Another gemach lends money to needy families to be used for housing, to pay for weddings, and medical needs. Borrowers must provide two guarantors and a specific repayment plan. One of Bambi’s newest projects raises money to buy tefillin for needy Bar Mitzvah boys. Many of Bambi’s families do not have the means to purchase tefillin for their sons when they become Bar Mitzvah, as they cost $500 and up. Instead, each day these boys must borrow or share other people’s tefillin in order to pray. Imagine the genuine joy of the new Bar Mitzvah boy when he receives his very own pair of Tefillin! Additionally, the Bar Mitzvah boy gets a new suit and hat for the occasion. How is Bambi’s tzedaka different from other non-profit organizations who help the poor? Matan B’Seter Bambi helps people whose poverty is accentuated by a medical or social crisis. Because it is run primarily by volunteers, it has an unusually low overhead (less than 3%), thereby directing more money to the recipients. Bambi’s lifetime of connections make her uniquely positioned to help people, and her compassion and dignified approach to distributing her funds are legendary. What gaps exist in Israeli government assistance to needy families? The Israeli government provides some financial assistance to widows and single-parent families, but others must be declared 65% disabled in order to receive any government aid. Even then, (s)he only receives a certain amount each month which does not cover all expenses. It is very difficult to get qualified for government assistance. The person must file an appeal, often incurring the cost of a lawyer, and the process may take up to two years. Unemployment insurance is provided for a maximum 9 months. There is NO HELP, such as food stamps, for regular low income families. Instead, government social workers refer families to private organizations like Matan B’Seter Bambi! Why do people in Israel require Bambi’s help for medical needs? Aren’t all medical expenses covered by Kupat Cholim, Israel’s socialized medicine program? There are many gaps in Israel’s medical coverage. For example, physical and occupational therapy coverage is very limited and the cost of many important medications, such as diabetic, cardiac, and psychiatric medicines, is only partially covered by the government. Dental work is not covered, nor is medical equipment such as wheelchairs, eye glasses, and hearing aids. How does Bambi find families in need? Needy families find Matan B’Seter Bambi through referrals from government social workers, doctors, teachers, rabbis, and through Bambi’s own extensive fifty-year network of personal connections. Unfortunately, there is no shortage of people in need: the Israeli National Insurance Institute reports that 25% of Israel’s population live under the poverty line, including 36% of all Israeli children. Surprisingly, 53% of these impoverished families are working poor. What are the criteria Bambi uses to qualify families for assistance? Most of Bambi’s families have a medical or social crisis: one or both parents are seriously ill, or they have children with chronic diseases, such as blindness, cystic fibrosis, juvenile diabetes, or cerebral palsy. Bambi also helps abused women and agunot. Before receiving assistance, all families must provide documentation of their situation from extensive hospital records, social worker reports, or from doctors and reliable rabbinical referrals. From her distinguished fifty-year career as a nurse and chief midwife at Shaare Tzedek Hospital, Bambi has the expertise to distill the relevant medical facts from these records. How does Bambi prioritize whom to help given limited resources? Children and women are given the first priority. Bambi’s assistance is used to meet basic human needs — such as food, rent, utilities, and medical care, when other conventional sources of support have been exhausted. Is there a committee that decides whom to help? Bambi consults with rabbinic advisors Rabbi Binyomin Finkel and Rabbi Moshe Uri Eisenstein when deciding on which families to help and regarding other important decisions. Rabbi Finkel is a Rosh Mesivta at the Mir Yeshiva and great-grandson of the saintly Rabbi Aryeh Levin. Rabbi Eisenstein is a respected dayan and expert in Jewish monetary matters. Bambi also works with Rachel Barzel, her financial administrator and government liaison. How does Bambi monitor the families’ situation? Every year each family receives a letter requesting new information which is reviewed to determine if they still qualify for assistance. How many families does Matan B’Seter Bambi help? What is the annual budget? 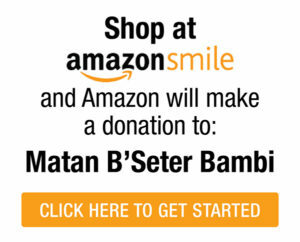 Matan B’Seter Bambi helps 400 families monthly, plus an additional 600 families for Pesach and Sukkot. The annual budget is limited only by the money raised — there are many qualified families who remain without any assistance on Bambi’s “waiting list” until additional funds can be raised. Bambi distributes approximately $1.3 million annually. What is the average monthly amount a family receives? The average assistance is $500/month but can be as much as $1250/month in special cases. What is the amount of time that families need assistance? The range of time varies widely — some families need only short term assistance or have a one-time need, but other families require help for many years. Does Bambi provide non-financial assistance to families? Bambi often arranges for pro-bono medical care. She also distributes donated baby clothing. In addition, she works with two gemachs. One gemach is a no-interest lending fund backed by loan guarantors from which people can borrow money for housing, medical needs, weddings, etc. The other gemach funds education and job training. What are some special projects that Bambi would initiate if she raised additional funds? If fundraising increases, Bambi would re-start her Emergency Fund to help people with one time needs. Bambi would also like to set up a Special Needs Fund dedicated to helping children with autism, cerebral palsy, and Down Syndrome with their prescriptions, diagnostic testing, psychotherapy, and medical equipment. 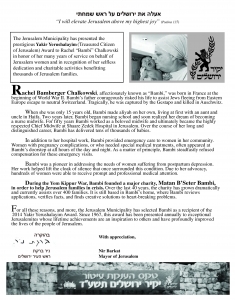 Rachel Bamberger Chalkowski, affectionately known as Bambi, is the legendary midwife of Jerusalem. Over her distinguished fifty-year career at Shaare Tzedek Hospital, she has delivered more than 40,000 babies. However, Bambi’s concern for families extends far beyond the delivery room, and she has devoted her life to to helping Israeli families in crisis. Bambi immigrated to Israel by herself when she was still a teenager. There she began a lifetime of service devoted to her people- first as a nurse and chief midwife at Shaare Tzedek, and later as the tireless force behind the tzedaka that she founded, Matan B’Seter Bambi. It all started with a phone call from friends in Lucerne, Switzerland during the Yom Kippur War (1973). Everyone was frightened by the direction that the war had taken and wanted to do something for Israel. Fundraising for Israeli families in need spread from Lucerne to Milan, to Antwerp, then London, and eventually to New York. Today, there are many fundraising chapters throughout the United States, Canada, South America, Europe, and Israel. Matan B’Seter Bambi’s current annual budget of $1.3 million helps over 400 Israeli families monthly (with an additional 600 families receiving help before the holidays) who are not only impoverished, but who are undergoing severe medical or social crises. People are referred to us by Rabbis, doctors, and social workers. We are careful to review each person’s medical and social documents before offering assistance, and we monitor our families for changes in their circumstances. In complex cases, we seek rabbinical guidance and our tzedaka has been endorsed by many prominent rabbis. The amazing thing about Matan B’Seter Bambi is the modesty and dignity with which the money is collected and distributed. Our families include widows and single parent families, adults and children with debilitating illnesses, (such as blindness, cardiac conditions, psychiatric disorders, cystic fibrosis, juvenile diabetes, autism, and cerebral palsy.) We also help abused women and agunot (abandoned wives). Our families cannot afford even the basic necessities of life– food, rent, and utilities–let alone the extra costs of their medical care. For example, the cost of many important medications are not totally covered by the National Health Insurance. Dental work is also not covered, nor is medical equipment such as eye glasses, hearing aids, and wheelchairs. We do our utmost to keep our overhead very low. Almost all of our work is done by volunteers. We work from our homes, saving the expense of an office. Out of the total donations, only 3-4% is used to cover mailing and professional accounting services.